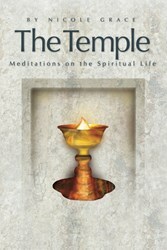 Leading independent book review journal, ForeWord Clarion, has awarded THE TEMPLE: Meditations on the Spiritual Path, by Buddhist mystic and award-winning author Nicole Grace, Five Stars (out of five). ★★★★★ Five Stars…artistically pleasing and spiritually inspiring. Two months into a national book tour for The Temple (Mani Press, 2013), leading independent book review journal, ForeWord Clarion, has published a rare five (out of five) star rating and review of the book. With standing-room only crowds and lines around the block for the author’s signings and events in San Francisco, New York and Denver, the acknowledgment from ForeWord caps a thrilling book launch for Buddhist mystic and award-winning poet, Nicole Grace. A few of the meditations in the book have already won individual poetry awards, and Grace’s previous books have won multiple national and international awards. Her book, Dreaming Bhutan: Journey in the Land of the Thunder Dragon was also honored with a five star rating and review from ForeWord Clarion, in 2011. Available now from Mani Press, 200 pages. The author continues her national book tour with a visit to the popular Mystic Journey bookstore in Venice, California, February 1, 2014 at 2:30 p.m. More information is available at: http://www.likeswans.com and on the book’s dedicated Facebook page: http://www.facebook.com/thetemplebook. Nicole Grace is a teacher, Buddhist mystic and author of the award-winning books, Dreaming Bhutan: Journey in the Land of the Thunder Dragon; Bodhisattva: How To Be Free, Teachings To Guide You Home; and Mastery At Work: 18 Keys For Achieving Success, Fulfillment And Joy In Any Profession. Her books, talks and recordings continue to inspire thousands of seekers around the world. Known to many by her spiritual name, Kundalini, she teaches a modern approach to spirituality and work, with uncommon wisdom, humor and warmth. For more information, visit http://www.likeswans.com.